T Hinges are a type of hinge that is shaped like the letter T. It is commonly used on gates and come in many different styles. T Hinges typically have one narrow leaf and one wide leaf. Monroe's tee hinges are all zinc plated or zinc plated black and made of steel. 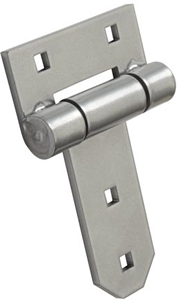 Tee hinges are used in many commercial and residential applications including for gates and doors. Characterized by a wide selection of series and sizes our tee hinges are perfect for most applications. Monroe Hinge & Stamping Company is ready to work with you on developing the right t-hinge for your application. All of our t-hinge projects start with a question, a print or a sketch. We are ready to provide you with the support your need to complete the design and manufacturing and delivery of hinges for your project. Are you looking for T-Hinges?